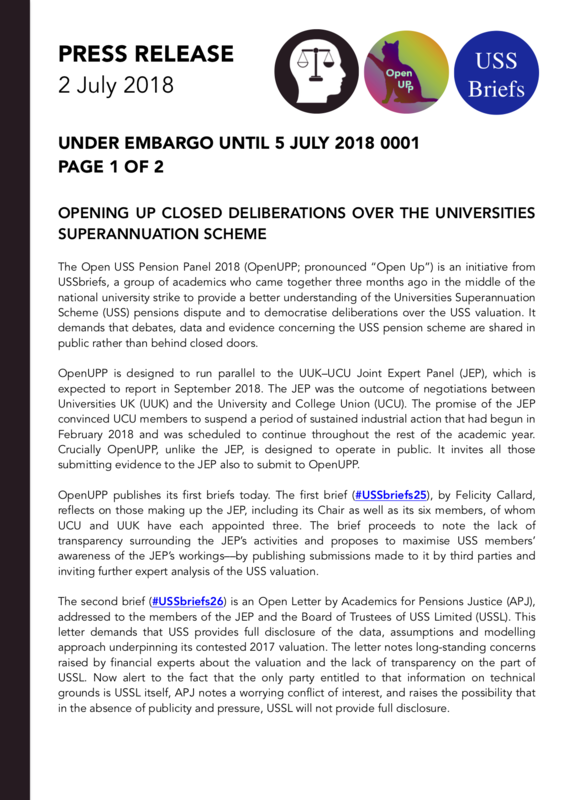 The Open USS Pension Panel 2018 (OpenUPP; pronounced “Open Up”) is an initiative from USSbriefs, a group of academics who came together three months ago in the middle of the national university strike to provide a better understanding of the Universities Superannuation Scheme (USS) pensions dispute and to democratise deliberations over the USS valuation. It demands that debates, data and evidence concerning the USS pension scheme are shared in public rather than behind closed doors. OpenUPP is designed to run parallel to the UUK–UCU Joint Expert Panel (JEP), which is expected to report in September 2018. The JEP was the outcome of negotiations between Universities UK (UUK) and the University and College Union (UCU). The promise of the JEP convinced UCU members to suspend a period of sustained industrial action that had begun in February 2018 and was scheduled to continue throughout the rest of the academic year. Crucially OpenUPP, unlike the JEP, is designed to operate in public. It invites all those submitting evidence to the JEP also to submit to OpenUPP. OpenUPP publishes its first briefs today. The first brief (#USSbriefs25), by Felicity Callard, reflects on those making up the JEP, including its Chair as well as its six members, of whom UCU and UUK have each appointed three. The brief proceeds to note the lack of transparency surrounding the JEP’s activities and proposes to maximise USS members’ awareness of the JEP’s workings––by publishing submissions made to it by third parties and inviting further expert analysis of the USS valuation. The second brief (#USSbriefs26) is an Open Letter by Academics for Pensions Justice (APJ), addressed to the members of the JEP and the Board of Trustees of USS Limited (USSL). This letter demands that USS provides full disclosure of the data, assumptions and modelling approach underpinning its contested 2017 valuation. The letter notes long-standing concerns raised by financial experts about the valuation and the lack of transparency on the part of USSL. Now alert to the fact that the only party entitled to that information on technical grounds is USSL itself, APJ notes a worrying conflict of interest, and raises the possibility that in the absence of publicity and pressure, USSL will not provide full disclosure. Demanding full disclosure, and a public statement from the JEP that full disclosure has been provided, the letter also highlights why this step is critically necessary for the successful functioning of the JEP. It notes the litany of prior valuation “reviews” that have taken place without this critical information. This time, major stakeholders, including UUK, are calling for transparency on the part of USSL. This is also the expectation of the many thousands of USS members who now look to the JEP to undertake a full and rigorous review of the 2017 valuation in a way that “cuts new ground”. For this, full disclosure on the part of USSL is urgent, critical and necessary. To find out more about OpenUPP (and to submit evidence and material to it, whether or not you are simultaneously submitting to the USS Joint Expert Panel) contact Prof Felicity Callard on f.callard@bbk.ac.uk. To find out more about Academics for Pensions Justice, email contact@uss-justice.org. USSbriefs (USSbriefs.com) is a set of papers written by University Staff and Students, on University Staff and Students, for University Staff and Students. The USSbriefs group are academics with varied expertise who came together in April 2018 to launch an intervention in the midst of the pensions dispute. They all supported the industrial action but have no formal relationship with either the Union’s national leadership or its committees. Academics for Pensions Justice is an unincorporated association, led by five legal academics, Dr Ruth Stirton, Prof Nicky Priaulx, Prof Lindsay Stirton, Prof T.T. Arvind and Prof Alastair Hudson. 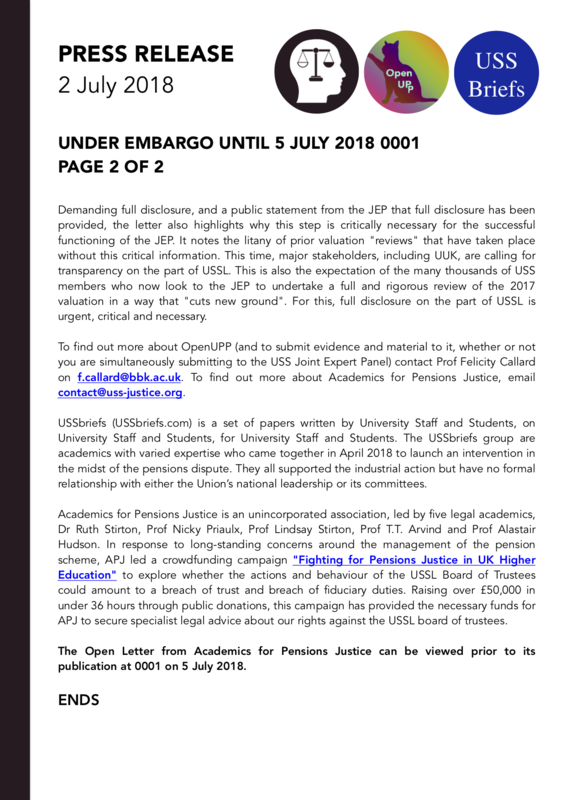 In response to long-standing concerns around the management of the pension scheme, APJ led a crowdfunding campaign “Fighting for Pensions Justice in UK Higher Education” to explore whether the actions and behaviour of the USSL Board of Trustees could amount to a breach of trust and breach of fiduciary duties. Raising over £50,000 in under 36 hours through public donations, this campaign has provided the necessary funds for APJ to secure specialist legal advice about our rights against the USSL board of trustees. The Open Letter from Academics for Pensions Justice can be viewed prior to its publication at 0001 on 5 July 2018. Download this Press Release as a PDF, or as PNGs (Page 1, Page 2).